Traditional meets contemporary in a favorite piece of jewelry that will never go out of style. 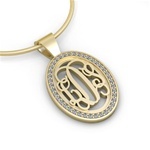 A Sorella Monogram Pendant is the one you never want to take off, because it complements everything you wear. 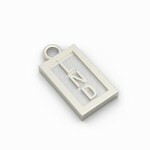 Choose one for a simple, yet very special gift for yourself or someone you care for. So classic and so personal. Sorella offers a variety of designs and lettering styles to choose from - traditional three-letter monograms and single initial and two initial designs; block, script, and more lettering styles. 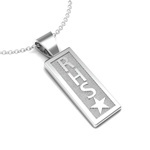 Your Sorella Monogram Pendant will be made to fit your preferences, for a truly one-of-a-kind piece. Select from a variety of precious metals: platinum, 14k or 18k gold (yellow, white or rose), palladium or sterling silver. If you wish, you may even combine these metals for a striking two-tone effect. Whatever you choose, we will make it into something beautiful.